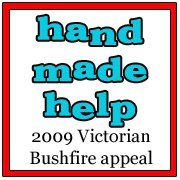 Handmade Helps Out is a group of crafty types who have joined forces to make raising money for the Red Cross and Wildlife Victoria more effective. Heaps of craft item sales and auctions are listed on the site with proceeds going to bushfire victims, as well as other ways crafty people can help out. Have a look through the items, perhaps something will catch your eye. Think about the birthday and other gifts you will want to give this year. My own felt hanging auction is still open until tomorrow evening, you can bid on it here. In addition to donating the entire proceeds to the Red Cross, I will donate an equal amount to Wildlife Victoria. I have just returned from a couple of hours at the RRR studios in Melbourne this morning sorting some of the toiletries that are being donated so generously by RRR listeners. When I arrived there were a couple of trestle tables in the perfomance space with donations already over and underneath them. By the time I left the room was like a warehouse and donations are still pouring in. If you're able to drop items off this afternoon, there is a need for NEW underwear. Other needed items are nappies, baby wipes, pads (including incontinance and maternity pads), tampons, toothbrushes, toothpaste, shampoo, soap. Clothing and food donations are not being accepted as part of this drive and additionally, all items must be new and unopened. Well done and thank you to Clem Bastow who is coordinating the drive and arranging a convoy of vehicles to carry the goods which will leave for affected areas tomorrow. This felt wall hanging is being auctioned to raise funds for the victims of the horrendous Victorian bushfires of February 2009. 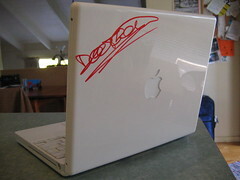 Bidding is open as of now and the auction will close at 10:00 pm Eastern Daylight Time Sunday 15th February 2009. The entirety of winning bid will be donated to the Red Cross Victorian Bushfires 2009 Appeal. A copy of the receipt as proof of donation will be sent to the winning bidder. The hanging will be posted free of charge to the winning bidder if within Australia or at cost to overseas locations. TITLE: "The dark forest moon rising in the last misty evening before the living shroud walks. With cobwebs." Felt Wall Hanging. MEDIA: Merino and Leicester wool, silk threads and fabric, soy fibres. Cotton backing. DESCRIPTION: A wall hanging handmade using a wet felt method. Wet felting involves the agitation of raw fibres using soap and water until they bind together into a single piece of fabric. Other than the cotton backing, no sewing or glues were used in the formation of this panel. 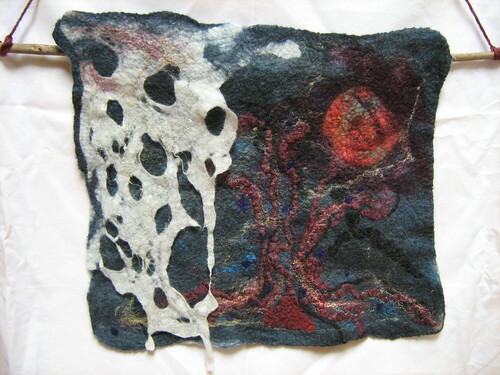 Due to its somewhat random and unpredictable nature, wet felting results in entirely unique pieces. This panel shows a gnarled tree with a full moon rising behind. The white foreground 'cobweb' hangs free, giving extra dimension to the work. Silk threads (some of it reclaimed sari fibres) give a sheen and a hint of colour. See here for more detailed images. The panel measures 40cm (15.5 inches) wide and 38cm (15 inches) high. A pocket in the back allows insertion of a rod (dowel or stick) for hanging, as seen in the photo. For ease of delivery a hanging rod is not included, however coordinating yarn will be, if you wish to copy the hanging method shown. Alternatively the panel could be framed by someone familiar with textile arts. HOW TO BID: Simply leave a comment on this post with the amount of your bid. Be sure to check back often as you may be outbid, especially towards the end of the week. You must leave a valid email address when you post your comment so you can be contacted if you win. I solemnly swear not to use any email address for nefarious purposes or pass them onto third parties. If you have any questions regarding the auction item or the auction process please email me: rachel AT mechanicalcat DOT net. THIS AUCTION IS NOW CLOSED. THANK YOU TO ALL THE BIDDERS! There are now 84 confirmed dead in the bushfires that continue to burn across the state of Victoria tonight. Hundreds of homes have been lost, and hundreds of thousands of hectares of beautiful bushland and farmland destroyed. It's almost impossible to comprehend. I'm sitting not a 45 minute drive from the devastated Kinglake area, yet I can't even smell the smoke. Donate blood within the next couple of days. And I'm going to offer up a felt piece originally made for a different charity auction (it was not bid on at the time). In the next post I will call for bids for the hanging and the high bidder at the time the auction closes gets the goods and the entirety of their winning bid will be donated to the Red Cross Appeal. I'll even cover the postage. So please spread the word, and look out for more details in the next post. Australian poet Dorothy Porter died in Melbourne this morning from complications due to cancer. She was 54. The writer is best known for The Monkey's Mask, a crime thriller in verse about a lesbian detective that was published in 1994 and won the Age Poetry Book of the Year in the same year. My thoughts go out to her family and friends. It's like something out of Woman's Day circa 1948. Except the part about the open-toed shoes. Feeling tired? Run down? Flat? Then you could drink 10ml of this product�s �bio-available oxygen� once or twice a day and �keep your body topped up with oxygen� for �enhanced quality of life�. Or you could breathe � which is widely regarded as the platinum standard for oxygenating your blood. To find out more and discover other exciting new shonky products check out the 2006 CHOICE Shonky Awards. Don't make me vote Liberal, people. This is the pre-school education policy Labor should be having right now. Instead of $300 bribes. How much is the rampant individualism encouraged by the Howard government responsible for the current delay and decline in childbearing or wanting that they are now trying to counter? A lot I suspect. The best part of this exchange between Cory Doctorow and a mystery "lawer" regarding a post about a case of Bad Samaritanitis, is the invention of the word "deflamorty". Make them notice: child care and feminism. [W]hat about the skilled women who are waiting at home for someone to notice that they are missing from the workforce? The response is: what about them? No one is going to notice. Women are not wanted in the majority of workplaces and certainly won't be missed if they aren't there. The extreme apathy of Australians has allowed, not only the rise of these human-unfriendly local, state and federal governments, but a reversion to post-WWII gender attitudes across the board. Government may claim that the marketplace will provide adequate child care places if there is a demand for it. But there is a demand and it's not being met. Perhaps this is due to the perceived femininity of caring for children. (Clearly an opinion held by people who have never looked after a screaming, sick toddler. One of the least feminine things I have ever done.) What group of money-hungry entrepreneurs is going to start a child care centre for goodness sake? That's not to suggest that what childcare needs is a wisecracking marketing team to make it more "macho". What it means is that the care of the young befalls to the community. Which should equal government. The trouble is that these governments, instead of taking care of Australians, have turned their sights to money-hungriness themselves. In Port Phillip, fees in council centres are set to rise to $73 a day, as the council withdraws all direct and indirect funding to child-care centres, passing on all costs to parents. This is an increase of 71 per cent in the past two years. So all things being unequal, what's to be done? Noise. Lots of noise. We need to teach our daughters and sons, and each other, that feminism is not in the past. It's relevant now. We may need to keep shouting out the achievements of feminists in the 1960s and 70s (and 1900s...), but we also need to shout out the new agenda. And that requires more energy, not less. Stop waiting for someone to notice; make them notice. Prime Minister John Howard has backed calls by NSW Chief Justice James Spigelman for Australians to improve their manners. "I think we have seen a marked deterioration in good manners," Mr Howard told reporters. Next he'll be telling us to take our elbows off the table, wear gloves while dancing, and respect our elders. "There is language used now on television that some people find offensive ..."
One of the most offensive phrases currently in use on television, and elsewhere, is "Prime Minister John Howard". There's more in The Age today on the child-care funding debate. By "debate", I mean a bunch of women across the political spectrum are clamouring for sweeping changes to the way childcare works to boost the flexibility, access and affordability of child care. With which I have no argument at all. Although some policies or strategies for change might be nice to read. Victorian Liberal senator Judith Troeth said better child-care access should be a priority. ... "If the Government is serious about higher levels of productivity and getting and keeping women in the workforce, we should make child-care funding a higher priority." That's an oxymoron, given the current government's Victorian-era atitudes. Howard wants both a productive economy, which necessitates as many people in the workforce as possible right now, but he wants women to a) have more kids to bolster workforce numbers in the future and b) stay at home to raise them. For the record, what I want in child-care is a subsidised place in a high quality facility with loads of highly trained, well compensated staff and an onsite museum (while wishes are horses). Abbey would go for two or three half days a week and we'd both gain enormously from it. I'd get the time I need to work on building up my skills and career, Abbey would get valuable social interaction. But we're not going to get anything even remotely close to that until Abbey turns three and can attend kindergarten (for which we have applied, have no guarantee of a place and for which we have to pay for in full). Until then we'll try not to get on each other's nerves too much as I balance my sanity against the amount of television Abbey watches. Barrie Elvish has a lot more to say on the subject at The Courier Mail - well worth reading. Vicki Dunne wants to extend subsidies to parents who stay at home - hear, hear! Bronwyn Bishop recommends subsidies include nannies and other private care, which sounds elitist until you remember that health care and emergency services run on shifts, so who else would care for their kids overnight? Australian mothers now have one of the lowest employment rates among OECD countries. In the year to September 2005, the price of child care jumped 9.1%. That's more than three times the official inflation rate. Only the price of pork and petrol rose more than child care. Ceridwen Spark's quality opinion piece in The Age last week.